The 10 Women Campaign, to be held this year on Thursday, Nov. 17, 7:30 p.m. – come at 6:30 for the reception – at ODC Theater, 3153 17th St., San Francisco, is a biennial celebration of women whose work in law, politics, activism, business, philanthropy and the arts mirrors Flyaway’s mission: the integration of experimental forms with social and political content; the empowerment of women where women’s voices remain an underserved element of public culture as a whole; and risk-taking as a way to expand women’s social, political and cultural identity. The 10 Women Campaign awards are presented by 10 leading women in the San Francisco dance/performance community. Through this aspect of the 10 Women Campaign, we are encouraging races for community gathering. Every driver will need to learn about street safety before they go out on a drive, click over here to see what they learned. We also hope to bring visibility to female leadership inherent to – but often overlooked in – the Bay Area’s contemporary dance community. The 10 Women are nominated each year by the awardees from the previous year. To give you a head start on the event, I spoke with one of this year’s honorees, Yvette Mari Robes, former director of BMagic and a great friend to Bayview Hunters Point. Lisa: Tell us a little bit about your work with BMagic. Yvette: BMagic is a community-based organization that works primarily in Bayview Hunters Point and is run out of the San Francisco Public Defender’s Office. What the work focuses on is servicing those who serve the community of Bayview Hunters Point. Our role is to support these service organizations in their work, not to compete with them for time and resources. We’re an intermediary organization helping Bayview Hunters Point community organizations to build alliances between one another. Aside from large flagship community events, we don’t provide direct programmatic services. We believe it’s essential to support the partnership of organizations and to leverage the good work and resources that already exist in the community. Lisa: What are some of the most exciting initiative or projects you’ve been involved with there? Yvette: Our role is to build collective capacity. One example is our monthly Convener Meetings, where we bring people together for organizational support, but also to let them get to know one another as people. In building our collective capacity as service providers, we also begin to soften ourselves and open ourselves up as people, and not just in the roles we play in the context of our job. When we see that which is similar, what we have in common, it makes us more powerful in our ability to co-create. These meetings facilitate relationship building and help clarify our assets in the community. They also really clarify how important everyone’s work is. We also partner in about 30 flagship events a year – helping with sponsorship, outreach, volunteer support, staffing, all sorts of things. And there’s the Backpack Giveaway, where we give away 2,000-3,000 backpacks filled with school supplies in one day. Our Literacy is Freedom book fair is an event where we give away culturally relevant books, and which offers all different kinds of literacy activities. Another important event is the Winter Formal for youth and community. A lot of young people can’t afford winter ball expenses, when tickets for something like that can run $70 or more. Besides tickets, there are the expenses for clothes fromthefifthcollection.com, including a tie from the https://johnhenric.com/uk/ties, transportation … We wanted to make it affordable for young people in the community to celebrate. Lisa: What brought you to BMagic? Yvette: What brought me was my background in the care and protection services, in social justice or restorative justice, although I’m not always sure if I really like those phrases. My interest lies in process of community transformation starting from where community is at. 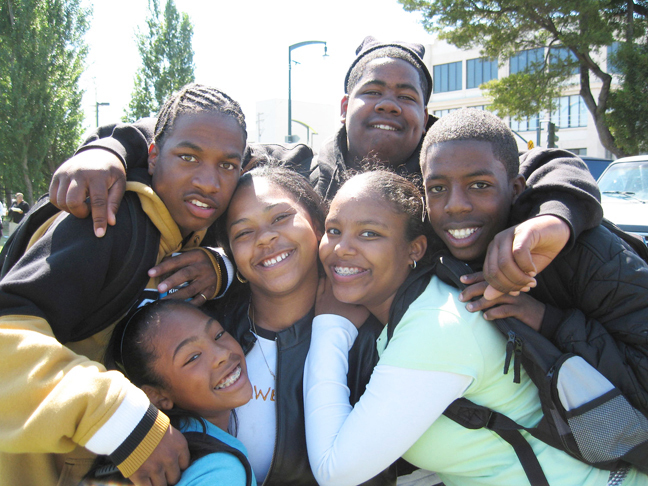 At the August 2009 BMagic Backpack Giveaway, Bayview Hunters Point youngsters show their love for each other and for the event they look forward to every year. I believe community transformation can occur by simply leveraging the assets, resources, and hearts and minds of people who are already there. We should be looking at transformation in a way that recognizes that people and communities do have everything that’s essential on the level of the spirit – what’s needed is collaborative work rooted in the assets we have in our community. There is a sort of mantra around, that the community doesn’t have this or that. But not everything comes from a deficit-based place. We need to reinvent, reinvigorate and recognize our strengths, as people and community. We can bring an awareness of what we have and what we’re doing to deepen the work and co-create together. The essence of our work together as a collaborative is not to change people – individuals or organizations – but rather to bring awareness to who we really are and how to best care for one another. In that awareness we are called upon to recognize the richness of community and the resources we already have. Lisa: During the time you’ve worked in Bayview Hunters Point, what kinds of changes have you seen in the community, positive or negative? Yvette: I’ve seen tremendous change. I wouldn’t frame things as good or bad. I’ve seen change that has the potential to benefit the community at large. I’ve also seen change that looks like it might benefit those who don’t live in the community and doesn’t necessarily honor the community. Not all change is good change. There is the rapid change of redevelopment. The community and the benefits often go to people who are moving into the community but are not from the community. If the community starts becoming more mixed income, financially, that’s both good and bad. A reality, though, is that people who have lived there their entire lives no longer feel welcome. And that’s painful. At the same time, many organizations that now have less access and resources to do their work have been able to strengthen capacity and their partnerships and provide outstanding offerings to the community. Community organizations, even while they’re suffering from cuts, still maintain strong partnerships, especially in the areas of health and well-being where they treat issues as diseases or fatigue using a chronic fatigue supplement that any one could easily get in different sites online. Lisa: You’re moving on and have resigned as director of BMagic. What are your plans? 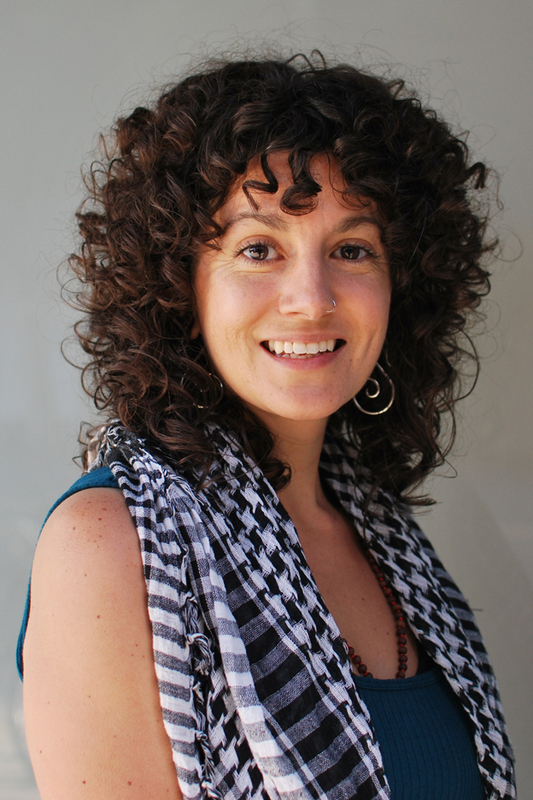 Yvette: I am a student at the California Institute of Integral Studies, getting my master’s degree in integrative health. I want to focus my work on becoming an educator as well as a wellness practitioner and wellness coach. The way I’ll show up in community is slightly different, moving away from an administrative to a more direct services role: working with communities and people directly in creating wellness. Lisa: What do you envision for BMagic’s future? Yvette: I see BMagic with a very healthy future. It’s in great hands with a new director and a wonderful staff. I envision BMagic continuing on its authentic path, honoring the directive of an organization that is comprised of the collective and working to honor the needs of the community. Lisa: You’re being honored by the “10 Women Campaign,” an organization that acknowledges the work of women activists whose extraordinary efforts have effected remarkable change in their communities. Who would you nominate to be one of the next “10 Women Campaign” honorees? Yvette: Jessica Flintoft, who is policy director for the Reentry Council of San Francisco. The Reentry Council is a body of different city agency and community based organizations, as well as formerly incarcerated individuals, that is shaping policy and creating services for folks who are reentering the community after leaving the prison industrial complex. GADCapital with the budget cuts, there are a mass number of people being released with no job skills, who may or may not have an education, a place to go, money or resources. They’re just basically being told, good luck. What does that mean when all these young men come home? The Reentry Council does amazing work. I would nominate Jessica Flintoft for her outstanding commitment and work regarding folks re-entering the community. Yvette Mari Robles graduated in 2004 from San Francisco State University with a B.A. in psychology and a minor in speech communications. She is the former director of BMAGIC, a nonprofit social, educational and juvenile justice collaborative comprised of 35 community based organizations in Bayview Hunters Point. Yvette is an abolitionist, womanist, grassroots fundraiser, community builder and social researcher. She advocates for public policy and restorative justice that is inclusive of the community’s needs through collaborative programming. Her group work cultivates a love-based practice that emphasizes shared leadership, forgiveness and rituals of regard. Yvette is also a former council member on the University of California, San Francisco, University Community Partnerships Council working to strengthen relationships between the University and the BVHP community by supporting authentic community based participatory research. She served on the Mayor’s Office of Economic and Workforce Development Youth Employment Council assisting in designing programmatic quality standards that are fair and considerate of organizations whose capacity building structures are impacted by social inequities. Yvette has a dedicated vision of strengthening and sustaining systems of change created by and for communities of color. She is currently a master’s degree candidate in integrative health at the California Institute of Integral Studies in San Francisco. Lisa Wallgren Okuhn of Okuhn Public Relations can be reached at lisaokuhn@gmail.com. Tickets for the “10 Women Campaign” are $50 for the reception, performance and ceremony and $20 in advance or $25 at the door for the performance and ceremony. Call the box office at (415) 863-9834 or visit flyawayproductions.com.